We’ve made ordering the 2018 calendar easier. 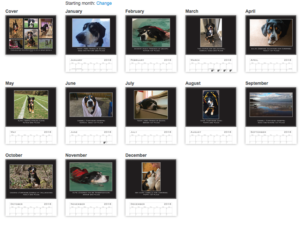 Just go to the Merchandise Page and use the Paypal button to order and pay for your calendars. Today we set out on the final stage before going to the Embassy in London tomorrow. Salvo and Izzy added 2.15 miles each. Then Dickens adding 4.4 miles took over to take us to the Royal Observatory at Greenwich. Sybil and Basil added 1.5 miles each to take us to Tower Bridge Road. Babeli, being a very cute but slightly independent puppy, chose to take us a different route with her 2.6 miles to get everyone to where we are meeting up tomorrow. She finished her stage at Clerkenwell before pawing over to Cleo. Cleo used her 2.6 miles to get us to London Zoo at the northern end of Regent’s Park. And that is where Bella, Wilma, Sybil, Izzy and Salvo will meet tomorrow to walk together for the very last stage of the walk. With many of the dogs on the stand at Discover Dogs today there were not many walkers. Salvo and Izzy set out and did 2.1 miles each. Then Dickens took over and added 6.25 miles, which was further than he’d planned because of a detour as a result of some sheep being fenced in with an electric fence. 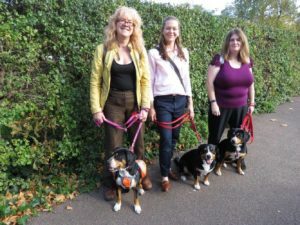 Finally we have a new walker joining the walk for Heidi as Cracker (red paw print) joins us to add 4 miles to our total and gets us as far as Sittingbourne. Today’s walks have brought us back onto English soil. Dickens has added 8.55 miles over the last two days and got us back onto dry land. Wilma, Alfie and Shadow then each did 1.3 miles and Salvo and Izzy did 5.2 miles each. Which means we end the night in Kent having just past Canterbury. Today was a little quieter than yesterday Elliot got us off to a start with 4.4miles then he pawed across to Salvo and Izzy who added 1.9miles each. 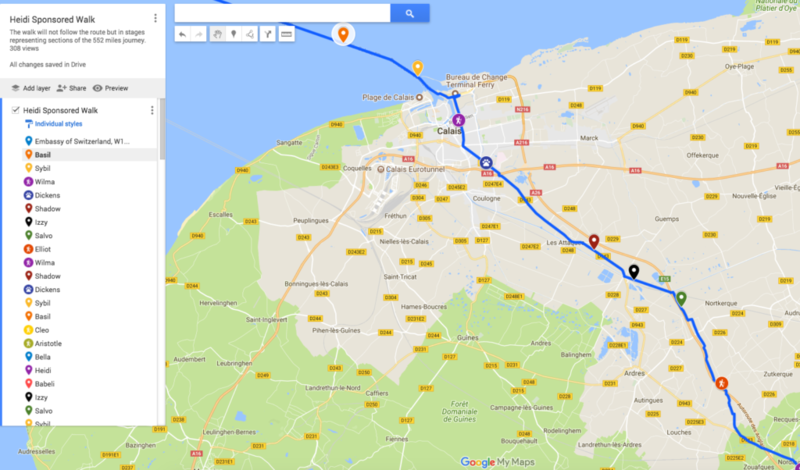 Aristotle had a rest today as his legs were hurting, so it was Shadow’s turn to add 1.3 miles and then her son Dickens added 4.3 miles to the total, brining us into Calais. After that Wilma went out and did 1.3 miles. It was Sybil who had to get her paws wet to start the Channel swim and Basil followed close behind they finished the day with 2.7 miles to Sybil and 3.5 miles to Basil. Which means we are now stranded in the middle of the Channel so it’s a really good time to sponsor us to get to the other side! We seem to have stepped up the pace today, although some was later on yesterday. Salvo and Izzy did a mile each and then added another 2 miles each later. Babeli added 4.56 miles and Heidi and Bella have managed 7.16 each. Aristotle, Wilma and Shadow each did 1.3 miles while Cleo added 3.36 to the tally. Basil managed 4 miles, Izzy I mile and Dickens added an impressive 7.9 miles. All that means we’ve now covered 437.7 miles of the journey and there is only another 115 to go! 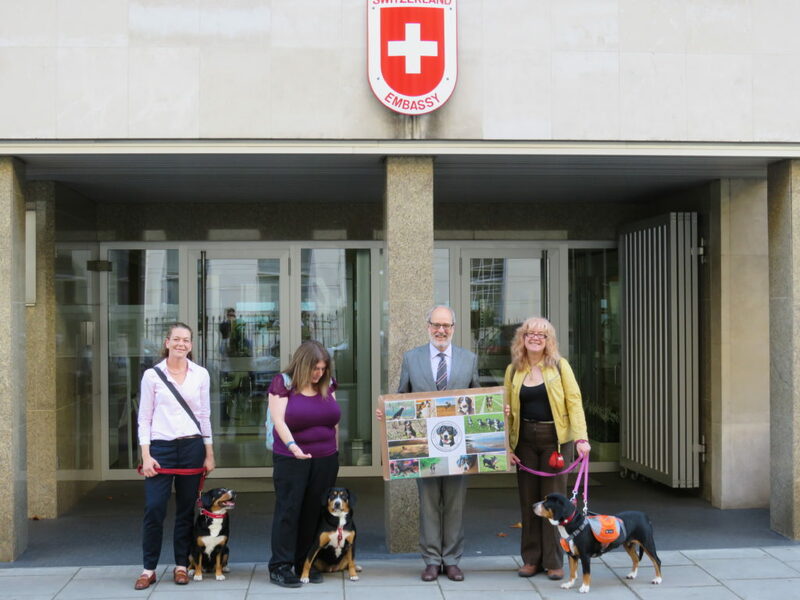 We may take a bit of a detour to visit one or two places with Entlebuchers along the way so that we arrive at the Embassy next week just in time. We may get to Calais tomorrow. Who’s up for a swim? There is only a week tomorrow until we are due to arrive at the Embassy and we’re making good progress. Today’s walkers have been Aristotle who managed another 1.3miles. Then Salvo and Izzy did 1.9 miles each. They pawed across to Shadow whose 1.3 miles brought us to Henin sur Cojeul. 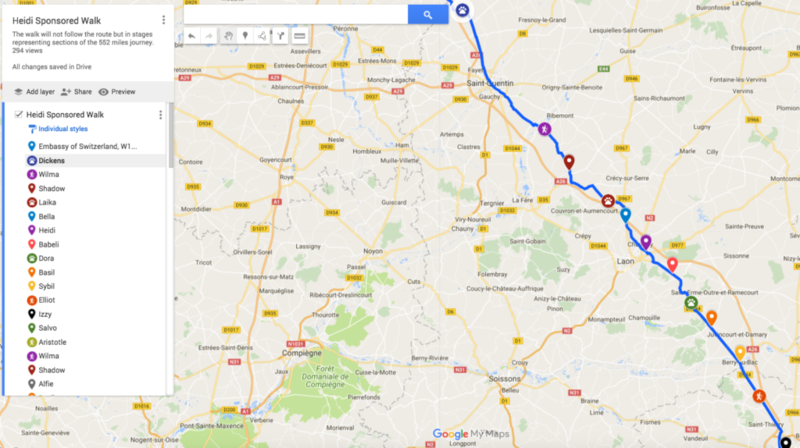 From there Cleo took over and added 2.9 miles, before Wilma added another 2.3miles bringing us to the outskirts of Arras. 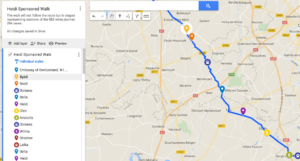 Finally Basil and Sybil added 4 miles each taking us through Arras and out to a place called Mont Saint Eloi. We’ve done 392 miles of the total which means there is just another 160 miles to go. Today was a quieter day for lots of reasons, but we’re making good progress and the photo is of all the walkers who got together for their big walk yesterday. Aristotle set off and managed to walk 1.3 miles today. He pawed across to Cleo, Heidi and Bella who each did 3.82 miles and get is into the Pas de Calais region. Then Dickens took up the pace and added another 3.6miles, before passing over to Basil for a 3.5mile stint and Sybil for the last mile of the day. Please sponsor us to encourage us to finish the journey and maybe do a little more besides! Thanks to the glorious weather the walking has been very enjoyable today. 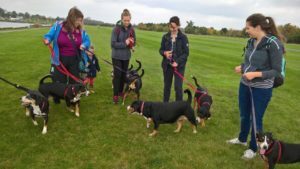 Elliot told us his walk this week of 3.3miles and then he set out with seven other Entlebuchers today to add another 4.2 miles each. Which means on the map there was 7.5miles for Elliot and 4.2 miles each for Sybil, Basil, Dora (green paw on the map), Babeli, Heidi, Bella and Laika (red paw on the map). 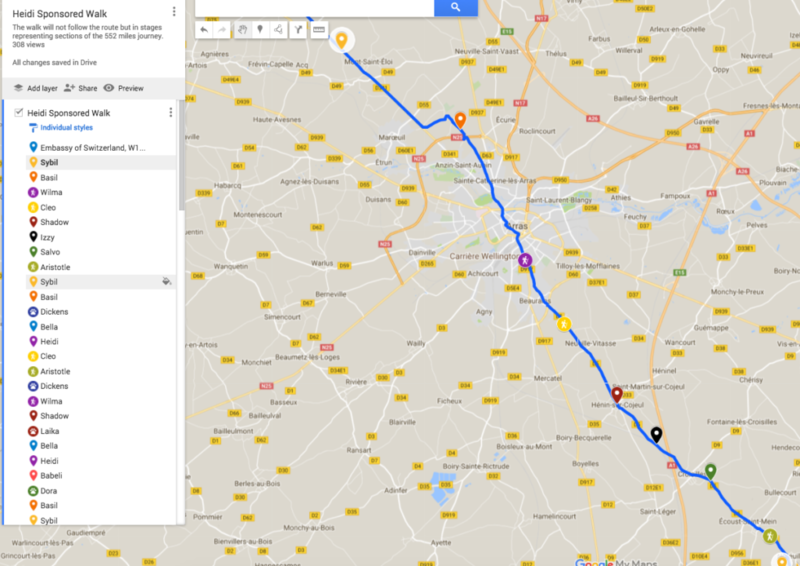 They took us past Laon and on to Couvron et Aumencourt. Then Shadow and Wilma set off and added 6 miles each bringing our total distance up to 335 miles. 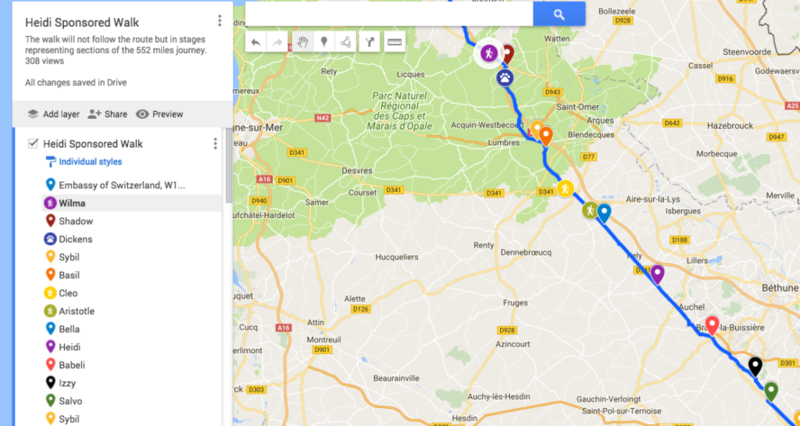 Then we heard from Dickens (dark blue paw print on the map) and he has done 17.3miles taking us past Saint Quentin and on to a little place called Bellicourt. That brings our total up to 352 miles and that means we’ve only got 200 miles to go!